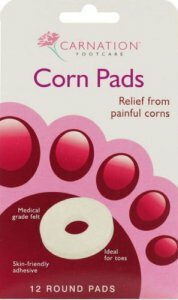 Carnation Corn Pads provide a traditional approach to pressure relief on painful corns. Made from high quality chiropody felt to absorb impacts and round shaped, ideal for corns on the side of toes. Corns are caused by repeated friction and pressure on the skin, usually due to poorly fitting shoes and hosiery. The skin becomes thicker to protect itself from the friction; eventually it forms a corn, which can be uncomfortable and painful. High quality chiropody felt spreads pressure and absorbs impact. Round for corns on the side of toes. Ensure skin is clean and dry. Peel off backing paper and apply pad firmly to the skin. Use each pad once daily, change daily as necessary.